Schramsberg and Davies Vineyards’ camp programs are the ultimate experiences for sparkling and still wine lovers! Come to one of our camp programs in the Spring or Fall to see, feel and taste the sparkling and still wine cycles – beginning in the vineyards and ending at the table. Experience a hands-on, behind the scenes look at the making of sparkling wine at Camp Schramsberg in the spring, and the buzz of harvest at Camp Davies in the fall. Enjoy meeting fellow campers and wine enthusiasts from across the country while sampling Schramsberg Vineyards bubbly, and Davies Vineyards still wines, with amazing foods. Campers can attend the Spring Blending session and/or the Fall Harvest session and participate fully in seasonal wine experiences — there is no other program like this anywhere else in the world! 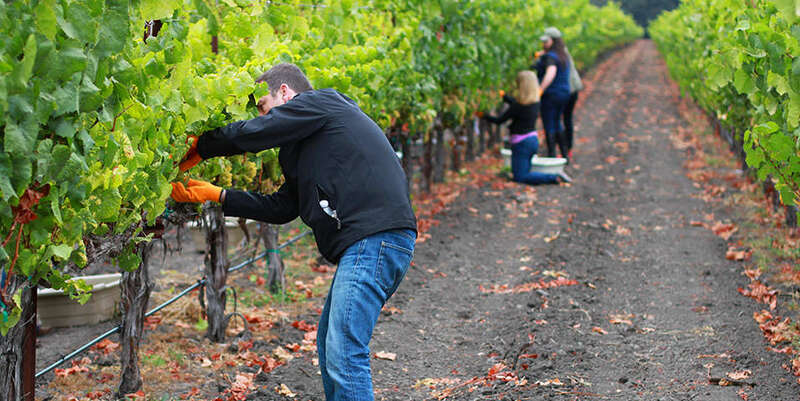 Both of our camps offer a fun-filled, hands-on, three-day immersive experience where you will participate in intensive learning and gain valuable expertise from some of the world’s most celebrated wine and food professionals – all held in the Napa Valley, the epicenter of food and wine. Our camp programs are perfect for all wine enthusiasts, and wine or restaurant professionals. In fact, it is our goal to have a combination of both consumers and professionals to make it fascinating for both sectors. Our camps are an enjoyable way to jump in and experience wine with all the senses in Wine Country, where it all happens. Camper Tuition: $1,450 per person (wine club discount applies). There is an additional charge of $145 for the optional Monday evening library wine dinner. Transportation and lodging are not included. Program subject to change. Scholarships are available for professionals in the wine and restaurant industries. For more information, please email camp@schramsberg.com or call 707-942-2408. Springtime in the Napa Valley is enchanting. Colorful mustard flowers are in bloom and a quiet sense of anticipation is in the air as the growers wait for bud break. The 3-day experience uncovers the mystery of this season and gives you the inside story of how sparkling wines are born. There will also be tours of the Schramsberg winemaking facilities and lots of bubbly tasting, hosted by our Vintner Hugh Davies. The Camp Schramsberg Spring Blending Session beings on Sunday with a sparkling wine reception and an elegant candlelight dinner prepared by a famous guest Napa Valley chef in the historic Schramsberg caves and paired with Schramsberg sparkling wines and Davies Vineyards still wines. The next morning, you’ll learn hands-on pruning in the vineyards with Hugh Davies and Director of Winemaking Sean Thompson, and how vineyard location, soil content, and clonal selection play a critical part in creating the complex flavors in Schramsberg’s wines. Back at Schramsberg Winery learn how sparkling base wines are made, harvest to tirage. As an added treat, you will learn how to saber open your own bottle of bubbly with hands-on instruction, a feat Napoleon would perform to celebrate battle victories. After lunch, enjoy a full afternoon of pairing sparkling wine and food under the direction of our food and wine educator, Chef/Enologist Holly Peterson. You’ll experience the classic sparkling wine pairings, and what chefs are pairing with sparkling wines today. The day finishes with an optional library wine dinner ($145 per person, in addition to the camp fee). The second day starts begins at Schramsberg, learning about bottle fermentation and dosage at the winery. You will take part in the art of sparkling wine blending (assemblage) and taste a sampling of base wines made from the previous harvest and create your own sparkling wine blend. Then you’ll learn the ancient art of hand riddling, with hands-on practice in our historic caves. After lunch campers experience a food and wine seminar focused on discovery and expanding menu options with sparkling wines under the direction of Holly Peterson. Campers will also work together in teams on a wine menu creation contest, with prizes awarded for the most creative menus. The camp experience closes with a sparkling graduation and certificate presentation. This program is currently utilizing a wait list. 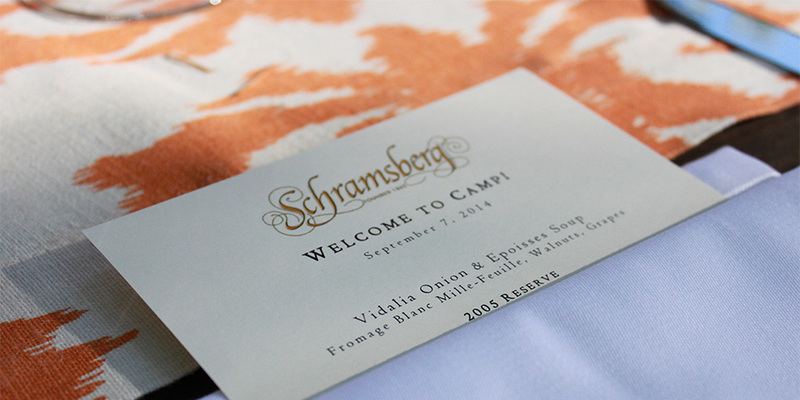 Please contact Camp Director Matthew Levy at camp@schramsberg.com to be added. Fall harvest in the Napa Valley is an extraordinary time. The Valley is buzzing with activity and the perfume of the crush is in the air. The Camp Davies Fall Harvest session kicks-off with an al fresco wine reception and dinner in our J. Davies Estate mountain vineyards. Campers will meet their instructors, Chef/Enologist Holly Peterson, and fellow campers and enjoy a lovely dinner prepared by one of the Napa Valley’s famous chefs and paired with Schramsberg sparkling wines and Davies Vineyards still wines. The next morning starts early as campers harvest grapes with vintner Hugh Davies and winemaker Sean Thompson, and learn how viticultural practices, attention to sugar and acid balance, and careful harvest techniques play crucial parts in creating the complex flavors of Davies Vineyards’ wines. Then it’s on to Davies Winery in St. Helena, where campers return to the winery for “the crush” and follow the evolution of the juice through the winemaking process. After lunch campers enjoy a full afternoon of interactive education, looking at the cause and effect of food to wine, under the direction of Holly Peterson. The day finishes with an optional library wine dinner ($145 per person, in addition to the camp fee). The second day begins at Davies Winery where campers learn the role that punchdowns, pumpovers, and skin contact play with the development of red wines. The morning includes tasting of base wines, on through the finished product, with Hugh Davies and the winemaking team. After lunch campers experience a food and wine seminar, further diving into the interaction that food plays on wine, under the direction of Holly Peterson. Campers will also work together in teams on a wine menu creation contest, with prizes awarded for the most creative menus. The camp experience closes with a small sparkling graduation and certificate presentation.